BOURCHIER, John, Lord Berners. 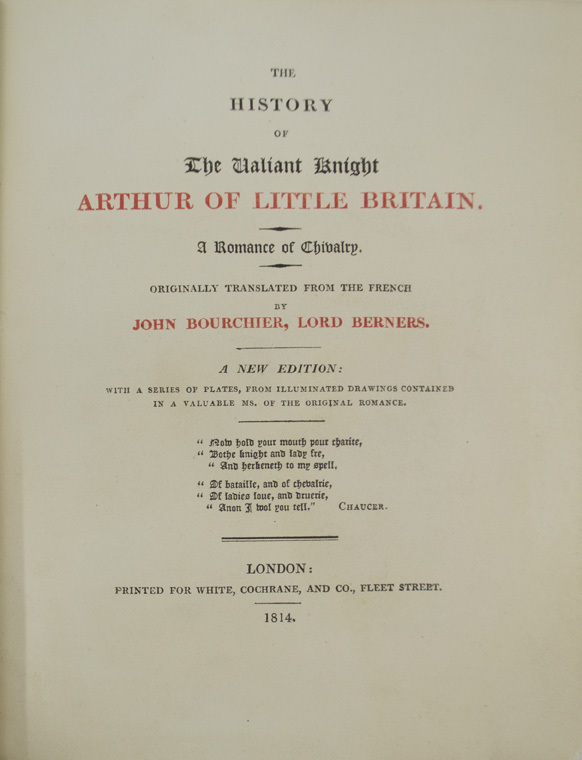 History of the Valiant Knight Arthur of Little Britain: A Romance of Chivalry. Originally Translated from the rench by John Bourchier, Lord Berners. 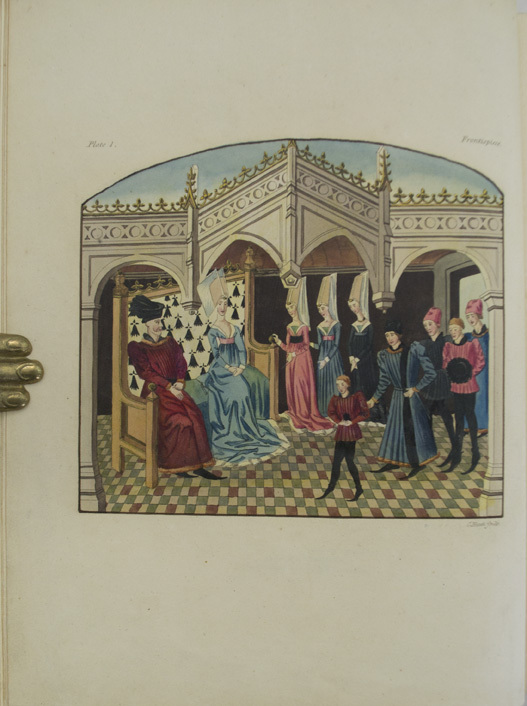 A New Edition: With a Series of Plates, from Illuminated Drawings Contained in a Valuable Ms. of the Original Romance. London: Printed for White, Cochrane, and Co. , 1814. "A New Edition." One out out of an edition of 200 copies, with 175 on small paper and 25 on large paper, according to the editor's preface. We presume this to be the large paper version (1 of 25) due to the large margins of this present copy. Quarto (9 x 7 1/8 inches; 228 x 180 mm). , xxvii, [1, blank], 544 pp. 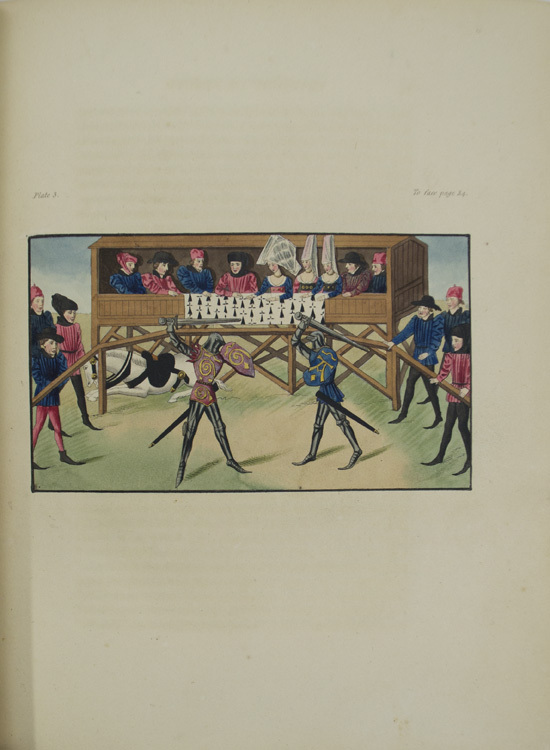 With twenty-five illuminated color-plates, including frontispiece. With half-title. Title-page printed in red and black. 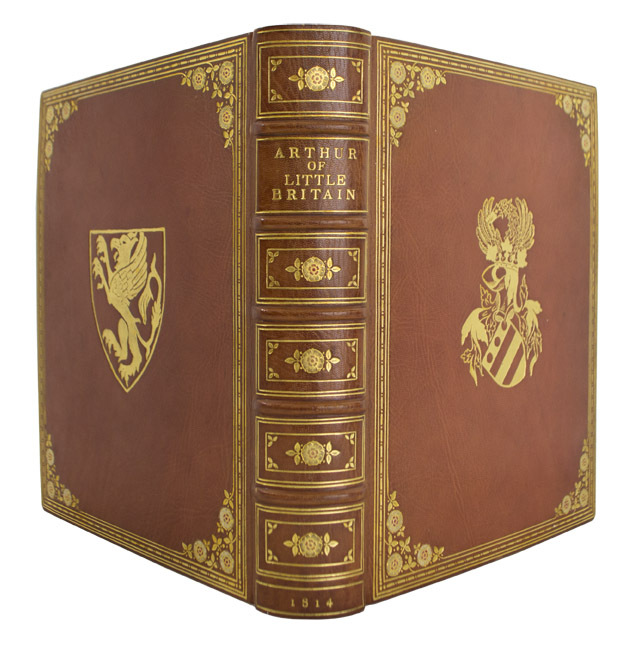 Beautifully bound by Sangorski & Sutcliffe in 20th-century full tan morocco. Boards quadruple-ruled in gilt. Front and back board with gilt armorial central devices. Corners of boards and spine with floral designs with onlaid white and red morocco. Spine lettered and stamped in gilt. 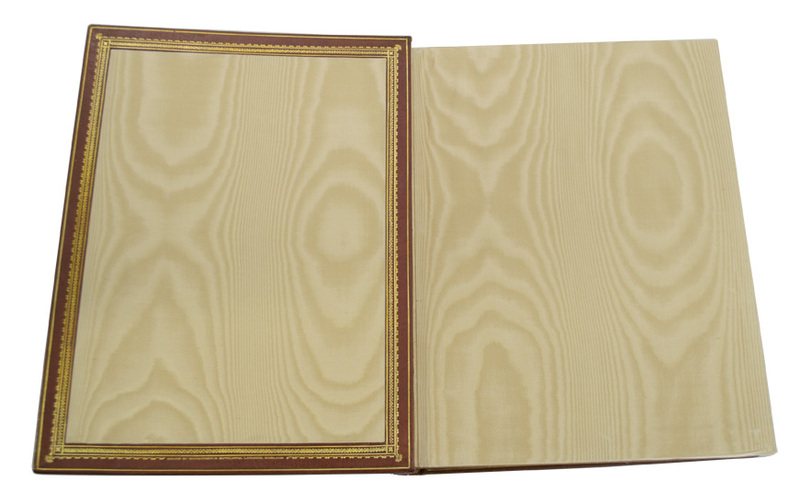 Board edges ruled in gilt. Gilt dentelles. All edges gilt. Watered cream silk endpapers. Ex-library bookplate of the Reeves Library of Westminster College, but with no library markings. Overall an about fine copy. "The first printed edition in the French language bears date in the 1493, and was in the library of the Duc de la Valliere, although Lenglet du Fresnoy, Quadrio, de Bure Osmont, and Tressan, have considered that if 1502 as the earliest. These writers have also omitted all notice of the 3d edition in 1536....Of the English translation we have notices of only three editions: the first, according to Ames, was printed by Robert Copland, without date; but which Herbert, from the title page conjectures not to have been the first: he confesses he had not seen the book. The next was printed by Robert Redborne, from which the present is reprinted... It only remains to say, that in this reprint, (which has been executed with great care,) the precise language and even orthography of Redborne's edition have been preserved ...Of this reprint only 200 copies are taken off; viz. 175 on small, and 25 on large paper." (The Editor's Preface).